The report details SpartanNash’s corporate responsibility efforts in 2016, highlighting its associate training and development programs; support of local farmers and food entrepreneurs; companywide giving initiatives and donations; and recycling and energy efficiency improvements. Associate and food safety programs to ensure safe work places and quality food in every aisle of the store or U.S. military commissary or exchange. Training and development and diversity and inclusion efforts for our associates to realize their career aspirations. Support of nearly 2,000 locally grown and locally made items and the farmers and businesses that supply these items. Community health and wellness initiatives, including Double Up Food Bucks™, Opioid Safety Project and Regional Wellness Specialists. Volunteering efforts totaling 20,234 hours and $456,276 in economic impact. $1.4 million in corporate giving initiatives, including $100,000 through the Direct Your Dollars™ program. $1.8 million awarded to community nonprofits by the SpartanNash Foundation. 525 million pounds of product donated to community food pantries and local nonprofits. Transportation and energy efficiencies achieved. The report also includes SpartanNash’s 2017 CR dashboard, which has guided the company’s continued efforts throughout the current year. The dashboard includes initiatives around local support, diversity and inclusion, volunteering and waste and energy consumption. 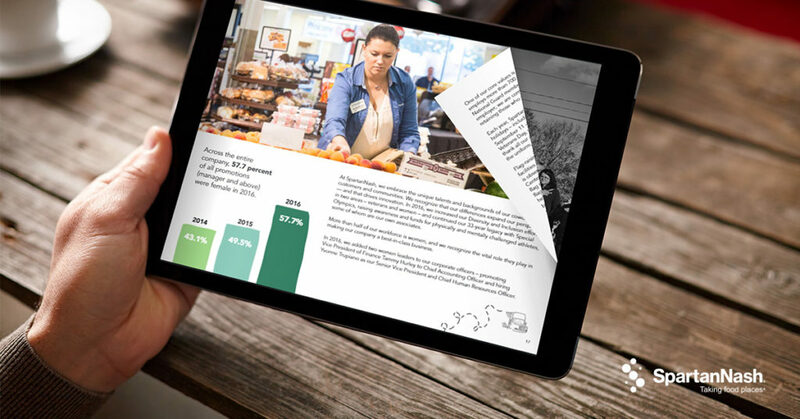 To exemplify its commitment to corporate responsibility, the 2016 Corporate Responsibility Report was printed in limited quantities using paper made from 100 percent post-consumer content, processed without chlorine, manufactured using renewable biogas and certified for reduced environmental impact by ECOLOGO. In addition, SpartanNash Graphic Services printed the report with soy-based inks. View the SpartanNash Corporate Responsibility Report at SpartanNash.com/CR-Report.